How the 2001 Gujarat earthquake gave a fillip to Narendra Modi’s ‘Gujarat Model’. In January 2001, the state of Gujarat in India was shaken by a powerful earthquake. Government figures based on death compensation records suggest the toll was around 13,000; the media settled on a figure of 20,000. The 7.7-magnitude earthquake also took a great toll on people’s livelihood and property, and the battle to determine how to put things back together became the dominant concern in the aftermath. Given that the 2015 earthquake has similarly shaken certainties in Nepal, we may look back at the Gujarat experience to gauge what might happen next. What happens when the dust of devastation settles? The answer is that a thicker and a more prolonged settlement of dust – the dust of reconstruction – ensues. Reconstruction is a messy and tortuous affair, and often, it is seen as a recurrence of the original disaster. Much of what has happened in Nepal resembles what transpired in post-earthquake Gujarat: stories of maladministration, aid comedy, miracles, blame, hostility, ineffectual decisions, but also compassion and generosity. We heard stories of map-drawing, competitive coordination, and of life still going on. We saw damage assessments, self-demolitions, anxiety about compensation scales and the uncertainty introduced by complex urban planning. Rebuilding cities and villages, and the attendant idea of ‘transparency’ became the central motifs of post-earthquake discussions. We also read of an anguished diaspora donating with characteristic nostalgia and enthusiasm. Writing the history of a disaster is an important exercise in the aftermath, not only as catharsis or contemplative self-reflection, but also because it forms a strong foundation for future politics. Conventional discourses and writings about disasters often have specific agendas and become the standard representations. As weeks become months, and fears of aftershocks recede, memories of the earthquake and its aftermath accrete around selective things. Earthquake amnesia is cultural, where fragmented memories, in the uncertainty and ambiguity of the immediate aftermath, take new narrative forms. In time, these narratives will become the history of the disaster. Against this backdrop, it is important to be vigilant about how the earthquake is remembered, for this process is complicated by political opportunism, the moral drift of humanitarianism and the hyperbole of disaster capitalism. The collective shock of a disaster leaves people and societies susceptible and vulnerable to change. In this state of exception, social movements can gain new ground, emergency ordinances can be passed, and certain acts of Parliament, which would be subject to scrutiny and opposition in peace time, can be rammed through. Or, conversely, all acts of governant may be projected as villainy, especially given the sensationalist slant of mass media. The Prime Minister of India, Narendra Modi, saw an opportunity in the 2001 Gujarat earthquake. He toppled his party’s incumbent Chief Minister Keshubhai Patel, largely on the platform of post-earthquake inefficiency. In October 2001, Modi, never having faced an election, took over as chief minister of Gujarat, becoming the first Rashtriya Swayamsevak Sangh (RSS) pracharak, meaning ‘propagator’ (who are full-time volunteers with the organisation), to hold that position. He displayed an adeptness at earthquake politics, building alliances and side-lining rivals in its name. Modi spoke at countless inauguration ceremonies, shrewdly deploying political language to gain favours for himself and his party. In the early days of his administration, he acquired political capital from the ‘success’ of the reconstruction initiative. Some years later, the same administration arrested hundreds of its employees for misappropriating post-earthquake funds. These arrests continue today, especially in relation to land-allocation procedures and contracts to clear urban and peri-urban rubble. Backed by media and humanitarian organisations, Modi managed to use the earthquake to promote the controversial ‘Gujarat Model’ of development – a central pillar in his bid to be the country’s premier – and to change the way government works. Disasters are mostly treated as logistical problems which require immediate attention and thus legitimise the intervention of various organisations. The rhetoric of ‘efficiency’ and ‘transparency’ is appealing in an aftermath. While bringing aid and relief to the victims is an important moral imperative, this ‘good work’ is not always neutral. Nor, in many cases, is it as efficient and smooth as it is often described to be. Like all socioeconomic activities, humanitarian aid is a political exercise, one with its own ideology and logic. In Gujarat, even as humanitarian intervention occurred with the explicit aim of ‘helping’ those affected by the disaster, there seemed to be a special focus on creating ‘heroes’ and ‘villains’. Along with bags of rice, concrete, and bundles of twisted steel, came efforts at proselytisation. These conversions emphasised the inferiority of the potential ‘beneficiaries’: victims of a disaster and morally deficient, yet to be converted or persuaded to other forms of belief and ways of being. The moral complexities and organisational sense of urgency which accompanies humanitarian intervention makes it difficult to see the long-term consequences of these actions. The end goal is always the logistics and efficiency of the intervention, or how you appear to the recepients of aid. Much of the literature on post-disaster situations in academia and the popular press emphasises the corruption and inefficiencies of global aid agencies. Some have compared international humanitarianism with older forms of colonialism and imperialism. In Gujarat, however, after the immediate emergency was over, the government was keen to make the relief efforts largely a domestic matter. Some of this involved selectively rejecting international aid, including those from some Catholic groups. Consequently, in the long-term, reconstruction became a provincial affair, which can only be understood against the backdrop of local politics and history. Caste, religion and identity became vitally important for those affected by the earthquake, both in protesting against delays and inappropriate interventions, and as a guide for how things were ideally to be put back together. In effect, it was a local manifestation of the larger battle over the idea of India, where even the past had to be rearranged to make Hindu majoritarianism and the neoliberal economy not only natural and logical, but also the most appealing. There is also another side of the aftermath, one which is more subtle and difficult to understand than the rise and fall of actors on the political stage. This is made of loans, bureaucratic forms, insurance schemes, urban planning and, in more general terms, infrastructure. Yet, it is no less influential in the way people will remember things, or at least, in the way they will forget them. Roads, bridges and model villages are concrete and visible realities, but the paperwork and policies which allow such things to come into being are more discreet. It is these invisible technocratic and political processes – so deeply important to the Gujarat Model – that Nepal should be aware of, and perhaps guard against. In response to the earthquake, the government of Gujarat quickly formed a disaster management authority. In two weeks, the Asian Development Bank (ADB) and the World Bank, with assistance from the United States Agency for International Development (USAID) and the Government of The Netherlands, conducted a joint assessment of the damage and decided that USD 2.3 billion would be needed for rehabilitation and reconstruction. But the survey was conducted in haste and the figure was rather arbitrary, possibly amplified by the shock of the disaster. Even then, it would be the figure on which the finances of the post-earthquake planning would be based. Responsibility for various aspects of the rehabilitation work was divided up between local and international organisations. Bilateral donors were to work on developing health awareness and medical facilities, emergency preparedness, and local capacity building. The World Bank took on agriculture, education and transport, alongside reform of urban governance. The ADB was to focus on rural housing, infrastructure, livelihood and hazard mitigation. The classificatory practices for damage-assessment and future planning, largely determined by the report templates of the development banks, were to have a permanent institutional impact. And the policies would be so designed that structures of governance and society would see radical changes. In other words, Gujarat was to be restructured. In rural Gujarat, each new or reconstructed village was to be given access to roads and community buildings, and supplied with water and electricity. New houses, built on public-private partnership models, were to be registered in the names of husband and wife, a measure intended to promote gender parity in relation to property. All payments to individuals for the reconstruction of a damaged house were to be made through the banking system. The stated rationale behind this was to ensure transparency. But it also meant that there were many new entrants into the regulated financial sector – over 365,000 new bank accounts were created within three months. The payments were pegged against the various stages of construction to ensure that new and stricter building regulations were followed. Finally, there was a mandatory policy to insure houses against future natural calamities. In these ways, the reconstruction programme connected the citizenry to the financial institutions, and ensured that the state was no longer the primary underwriter of property damage caused by natural disasters. Numerous community participation programmes were held in affected areas with local involvement so that they might get benefits like housing assistance and access to public services. Volumes of printed information and instruction were produced, and countless workshops, meetings and presentations were held in hundreds of villages. Such programmes were pushed hardest in rural areas, where liberal ideas of responsibility and decision making came face to face with caste hierarchies and other entrenched forms of power and inequality. The results within ‘communities’ were usually not as ideal as on paper, but in the process, village-level mechanisms of governance were strengthened and the general awareness of rights and privileges was enhanced. Housing construction and community participation programmes were to have profound effects on the countryside, not as a direct consequence of the policies but as a product of how they were managed. The first policy to be announced was on the public-private reconstruction of destroyed and damaged villages, which involved the relocation of residents. 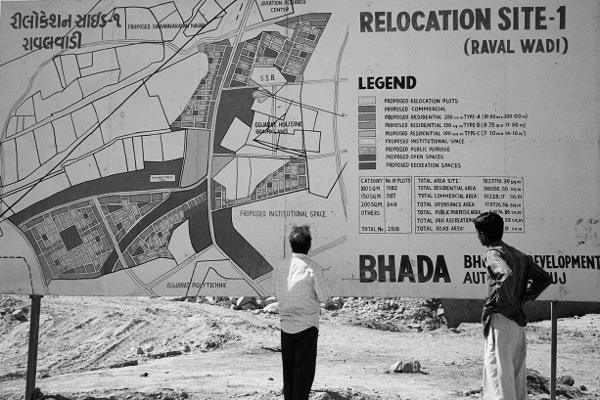 The idea of relocation was met with public protests, and after various modifications to the scheme, most villages were eventually rebuilt in more or less the same locations. Villagers reasoned that a life far removed from farming lands, places of worship and graveyards would result in increased hardships. In addition, moving villages and creating new ones led to complications of law, governance and jurisdiction. As in most sectors of post-earthquake reconstruction, what happened on the ground was quite different from what was planned. The scheme became popularly known as the ‘village-adoption scheme’, where private groups were to design and oversee the construction of new villages, with the government subsidising up to half of the cost. A wide array of different interest groups – aid organisations, religious groups, political parties, state governments, social movements, construction contractors and captains of industry (including a manufacturer of chewing tobacco) – took charge of reconstructing villages in the manner they saw fit. In the process, new social, political and religious ideologies were imposed upon provincial Gujarat. The straight lines of rebuilt villages seemed to impose an artificial uniformity and blandness on a vibrant and deeply diverse group of people. The ways of the past appeared, at least in the first few years after the earthquake, to be firmly on their way out. This was most evident in the district of Kutch in the far west of Gujarat, which was the most affected by the disaster. Until Independence, Kutch was a princely state, with its own language, currency and courts. When the British left, Kutch became a separate state, governed directly from New Delhi. This did not last long and Kutch eventually became part of Gujarat when the older Bombay State was bifurcated. The big cities and seats of power in the new Gujarat lay in the east. Kutch in the west was always seen as under-developed and peripheral to state-building activities. The spirit of independence and a sense of being different from mainland Gujarat lived on in Kutch in the postcolonial decades. Sometimes this sense spilled over into politicised resentment, but mostly it lived on in the unmistakable pride people had in who they were and particularly in the character of the land on which they dwelled. The humanitarian invasion of the region after the earthquake came overland from the east, the western-most border with Pakistan being militarised and closed. For many in Kutch, this was akin to being taken over by the same outsiders who had consistently neglected and marginalised the district in the postcolonial administration. Questions of language and identity were at stake, and it was often said that the outsiders who had come to reconstruct Kutch had no interest in local sensitivities, customs or history. Many came to build model villages based on metropolitan or romantic notions of rural life. Others built villages around temples dedicated to deities with no previous connection to the village. There were heated conversations about the future of rural housing. Some thought new technology and perspectives on housing would thwart the opportunism of future earthquakes. Lunar exploration technologies, fibre glass domes and new forms of plastic accommodation were discussed. Unsurprisingly, given both the efficiency of construction and the powerful lobbying of the industry, reinforced concrete was decided upon. The community-participation programmes created and facilitated the registration of complaints, and months were spent in questioning the suitability of such houses. There were genuine technical issues: these houses stored excess heat and used poor-quality materials and shoddy construction methods. There were also practical problems. Inadequate elevation of the houses led to water ingress during the monsoon, and some contractors vanished with their advance payments. Other houses were dismissed as inappropriate for rural agrarian life, which led to circular discussions on the ‘cultural suitability’ of the new constructions. The villages also saw instances of miscommunication and mutual incomprehension between the locals and the ‘adopting’ agency. A group of wealthy Jain philanthropists from Mumbai, for example, built a new temple in the village they reconstructed. They installed their own deity above the head of the village deity, an unusual formation which reflected their own attitudes towards those they were helping. In another village, a Catholic development organisation mounted bright ceramic plaques on the houses it had built. In addition to their logo, they added the words ‘labh’ and ‘subh’ or the number 786 – auspicious markers in Hinduism and Islam, respectively – on these houses depending on the religion of the inhabitants. The move was an attempt at working with the customs of the locals, and indeed, some Hindu and Muslim families do often place such markers around their houses. However, given the charged communal atmosphere in Gujarat, the actual effect was to make publicly visible the religious identities of everyone in the village. Organisations with sympathy for or links to the ruling Bharatiya Janata Party (BJP) government adopted the villages with the greatest visibility, emotive pull and political poignancy. Many of these villages were on the main highway into Kutch from the east. The resulting construction boom led to something of a saffron strip, and a highway littered with signboards and entrance gates to villages promoting the names of both religious and political organisations. The Vishwa Hindu Parishad (VHP) adopted what was initially thought to be the village closest to the epicentre. The organisation used its construction and inauguration as a platform for a series of hard-hitting electioneering speeches focused on the ‘evils’ of Muslims, Pakistan and the Congress party. It is no secret that the strategic objective of international development banks is high growth rates of national economies. They do this in the belief that expanding and deregulating market economies is the best way to increase employment rates and decrease poverty levels, an economic paradigm known as neoliberalism. In this model, the positive effects of economic growth outweigh all associated and proven costs. Often, loans made by these banks for infrastructure development or post-disaster reconstruction come with conditions aimed at embedding the broader objectives of the banks in the political and economic structures of the recipient countries. Such conditions typically insist on the deregulation of markets, privatisation of the public sector, and a reduction in the state’s stake in the economy. The Gujarat goverment generalised the pattern of damage in its communication with the World Bank, implying the disaster had damaged a greater area than it actually had. And the pressing need to rebuild villages and towns became an opportunity to create new institutions, and ‘reform’ the financial and governmental sectors. The process of rebuilding towns led to new systems of land management, removal of protectionist legislation, new building codes, and the ‘streamlining’ of property and land-acquisition regulations – measures intended for greater incorporation of private and public properties into the financial system. Building and design specifications were rewritten to incorporate Indian Standard Codes for seismic and cyclone safety. The principal towns of the region were to be given new water, road and lighting systems. Urban planning was to be improved and long-term development plans were to be prepared. Height and density restrictions were imposed to reduce the number of dangerous structures and population density. Revised development zoning was to improve the aesthetics of these towns and reduce their vulnerability to hazards. As in rural areas, on paper these aims for urban areas look like sensible development interventions in the aftermath of a tragedy. In practice, however, the provincial towns became building sites for many years. In this way, policies conceived in Geneva, Manila and New York found their way onto the now well-paved streets of Gujarat. The loan conditions remained poorly understood on the ground. There was also much confusion about the new structures of governance. For instance, rural and urban populations came to be subject to different policies and institutions. They tried to interact with the state they knew of old, but it was no longer there. The consequent confusion angered and befuddled some people for many years. Indignant, some influential locals in Kutch mounted a campaign for independence from Gujarat, a demand which was publically rejected by the then Prime Minister Atal Bihari Vajpayee. Especially in urban areas, it was the conflict between the people and the reformed state which became the central and the most bitter element of the aftermath story. Many of these processes resonate with what has happened in the immediate aftermath of the Nepal earthquake. International development banks, which had already been investing heavily in the country before the disaster, quickly gathered information in order to produce estimates of the damage. Generally based on the spontaneous data-sharing of those involved in relief coordination, the numbers and scales so produced are often imprecise. Classifying intervention through large categories like ‘district’, for example, overlooks important differences in local patterns of damage. Yet, these estimates are the ones which will channel investments and restructuring for years to come. With a similar sense of haste, damage to buildings and infrastructure was assessed. Forms and schemes of damage evaluation for houses, schools, government offices and roads were produced and circulated. In the process, technicians and engineers have become important and influential figures. These surveys will guide the investment schemes of development banks; they will constitute the basis for decisions about how and where things will be rebuilt. Perhaps, more importantly, they will provide the government, banks and insurance groups with a template for the refinement of policy and loan schemes. The response to the earthquake has produced some questionable standard narratives. At the most general level, problems in Nepal were ascribed to domestic causes, rather than a function of how aid workers have approached the country. If a jeep broke down, the blame was placed on the condition of the trail, not the jeep or poor route planning. Porterage has only rarely been considered an operational option for the aid agencies, despite the embeddedness of the system in the country. The important work of local radio stations was overshadowed by complaints about internet access. In a curious twist of logic, the efficiencies of local ways of doing things has often been overlooked by international organisations whose mantra has been ‘efficiency’. Of course, looking at the world through humanitarian eyes, villagers could only be seen to be lacking something. The villages of the country were endlessly described in the international media as remote places, where life is hard. Relief was said to be hindered by inadequate infrastructure, while both the remoteness of villages and the degree to which the distribution of relief materials was actually hampered by poor roads is open for debate. However, such coverage created a widespread perception that the lack of roads was the problem in the country. Building upon well-established schemes of rural development, like the DFID-funded Rural Access Programme, governmental and private institutions might thus find the earthquake an ally for pushing schedules ahead and creating new projects and working committees. With increasing talk of public-private financial arrangements and petro-mobility, road infrastructure could become a major political project, at national and international levels. Aftermaths are never simply a matter of putting things together the way they were. They are often occasions for radical transformations, both good and ill. They offer vision and space for experiments with ideas of development and modernity. For those living in the ruins, interventions in the aftermath can bring all manner of change, some exciting, some dreadful. Research in Gujarat suggests reconstruction can be used to drive local and national agendas and entrench ideologies. Reconstruction also brings confusion, anger and competetive cultural politics. In effect, natural disasters of great magnitude allow not only a radical shift in the terrains of political economy, but also a reorientation of history. ~Michele Serafini is a PhD candidate in Anthropology at SOAS, University of London. He is currently working on a project about football, youth culture and social change in the Lamjung district of western Nepal. ~Edward Simpson is Professor of Social Anthropology at SOAS, University of London. He is the author of The Political Biography of an Earthquake: Aftermath and Amnesia in Gujarat, India (2013). ~This article was first published in July 2015.